Perforated elevator platforms to replace the four solid plastic platforms included in Tamiya kit of CVN-65 USS Enterprise in 1/350 scale. Etched in heavy sheet brass with full see-through gridwork, reinforcing strips, tie-down rings, and even the extended plating on Elevator No. 2 as seen in prototype reference photos. Sheet styrene can be used for side plating on underside by using the kit's elevators as guides, or the plastic side plating may be carefully cut away from the Tamiya elevators and transferred to the etched brass versions if desired. These four etched platforms are exact matches for the plastic parts to ensure a precise fit. Instructions are etched into the edge of the brass sheet. Fits Tamiya nuclear-powered aircraft carrier Enterprise (CVN-65). 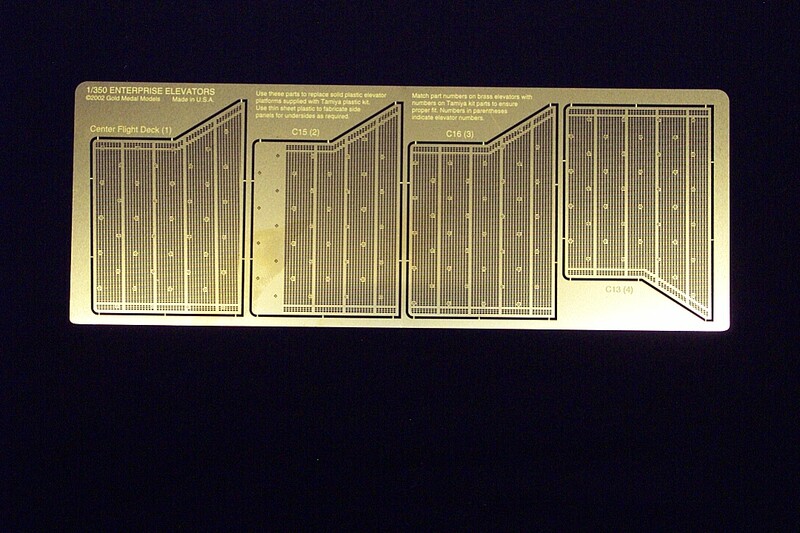 SEE PHOTOS AND A REVIEW OF GMM'S 1/350 ENTERPRISE ELEVATOR DETAIL SET!